Professor Kurt Dyrhaug from Lamar University’s Department of Art participated as an invited artist in the third International Crosscurrent Exchange Show in Tokyo, Japan, March 20-28, 2015. Dyrhaug, a sculptor, was one of 15 artists selected from the United States to show their work at the Tokyo Metropolitan Art Museum. Suguru Hiraide, associate professor at Midwestern State University, and Yasunari Nakagomi, director of the Association of International Artists Exchange in Tokyo, co-curated the exhibition. During his 11-day visit, Dyrhaug met with many contemporary artists in Tokyo, including Shiyo Kodama, Noriyoshi Matslmoto, Tadashi Aono and Keizo Tawa. He also toured Nihon University College of Art, Tama Art University and Tokyo Zokei University, as well as numerous temples in Kamakura. “I am looking forward to sharing this international travel with our students and implementing these cultural experiences into my visual language of sculpture,” said Dyrhaug. For more information about the Department of Art at Lamar University, call 409-880-8141 or visit lamar.edu/art. 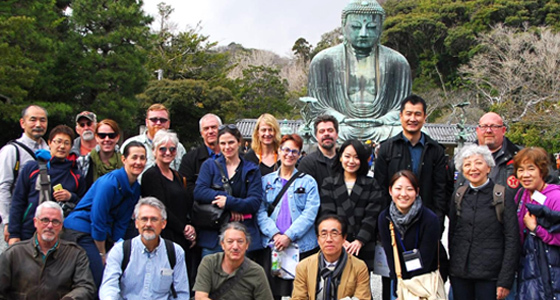 Pictured above: Artists from the third International Crosscurrent Exchange Show visit the Great Buddha of Kamakura (Kamakura Daibutsu), a bronze on the grounds of Kotokuin Temple. 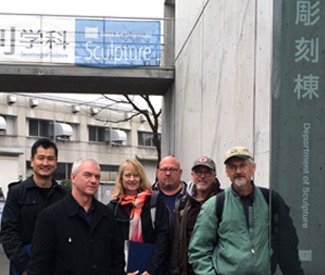 Pictured right: Kurt Dyrhaug (3rd from right) and exchange artists visit Tokyo’s Tama Art University.